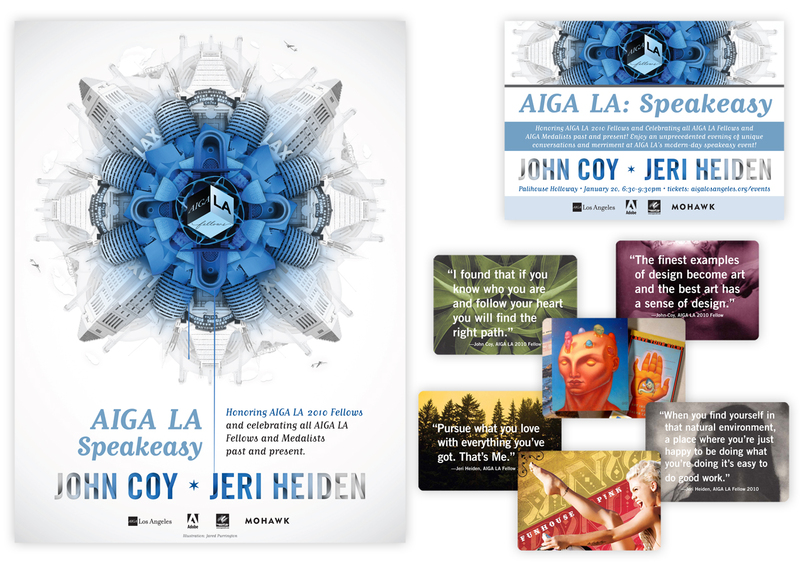 Event poster, registration postcard and on-site collateral for the AIGA LA’s premiere gala event, honoring designers who have made significant contributions to the Los Angeles design landscape. This 200+ attended gala took place at The Palihouse in West Hollywood, so we worked with the decor to create a speakeasy theme to get everyone in the mood to meet, talk and speak easy. The outstandingly talented Jared Purrington illustrated the mandala of Los Angeles architecture and honoree’s names for the poster, and we worked an event brand around it, creating a print, online and email campaign to get everyone excited to register. Once on-site, attendees were given gifts of scout books, bookmarks, and tables were decorated with a series of 54 different cards depicting various design excerpts from each fellow’s body of work with some of their most inspirational quotes. The event sold out beyond capacity, and the AIGA LA board and both honorees were very pleased with the celebration of their work.